This Divider Kit from TrekPak is designed for use within a Pelican 1510 Carry-On Protector Case. It can replace an existing divider system, or be used to create partitions within a compatible and completely empty Pelican case. TrekPak divider kits utilize water-, tear-, and shred-resistant foam dividers with a corrugated plastic core, plus steel U-shaped divider locking pins. Once installed, they maximize available carrying space, protect equipment or valuables for transport, and provide interior organization that can easily be rearranged or customized along with any changes to the contents of the Pelican case. The divider kit's design allows one of the two prongs on a divider locking pin to be inserted within a partition's corrugated core. Two adjacent partitions can accommodate both prongs on a single divider locking pin, resulting in them being firmly held together. Each divider locking pin features a nylon pull tab for easy removal, and the rapid release of any connected partitions. Included within this divider kit are two perimeter insert sections, two 18" divider sections, two 15" divider sections, 20 divider locking pins, a divider cutter, and one bottom as well as one convoluted, egg-crate top foam unit. To ensure that the dividers properly correspond to a Pelican 1510 Carry-On Protector Case's 7.60" internal height, the bottom foam unit must always be used when installing this divider kit. The perimeter insert sections can then be placed on top of the bottom foam unit so that together, they conform to the interior sides of the Pelican case. Like the dividers, the perimeter insert sections are constructed from foam with a corrugated core so a partition can be connected to the perimeter insert sections by a divider locking pin. 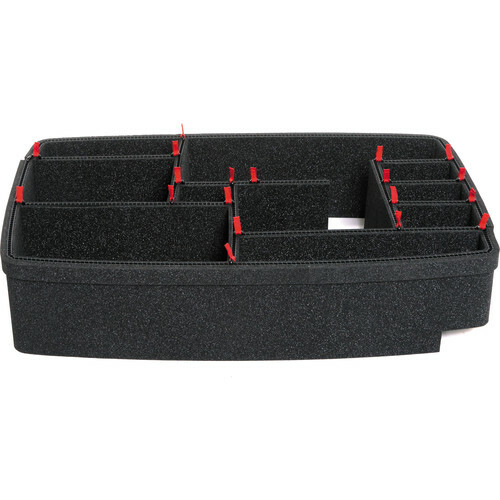 Items to be stored within the Pelican case can then be arranged on top of the bottom foam unit and within the perimeter insert sections before they are segmented using the dividers. Like the divider locking pins, the cutting tool integrates with the dividers' corrugated core. Multiple partitions can be quickly, easily, and precisely created by sliding the cutting tool through the dividers which can then be arranged and rearranged according to whatever is placed within the Pelican case. A previously-installed top foam unit within a compatible Pelican case's lid does not need to be replaced with the included convoluted, egg-crate foam. However, when in use, the egg-crate foam's soft peaks help maximize cushioning to the contours of items that come into the most contact with it. Box Dimensions (LxWxH) 24.0 x 13.0 x 6.6"
Divider Kit for Pelican 1510 Carry-On Protector Case is rated 4.7 out of 5 by 58. Rated 4 out of 5 by Ketterman from Excellent product, just take your time. This insert is definitely made well and can help organize your case better. I would caution you however to buy this on the idea that it would save you a lot of space over the standard Pelican dividers as some others have mentioned. While it is a great product I have not found it to save me a lot of space. I honestly would have just stuck with the padded dividers had I known what I know now. If the dividers don't provide you enough flexibility then by all means this is great. Rated 5 out of 5 by Jason from Very impressed Like the reviews say, easy to install and super clean results.? The material is extremely sturdy.? Kit includes a piece of foam for the bottom of the case and a piece of "egg crate" foam for the lid.? I don't usually give 5 stars but this is one of those rare products that really impressed me that much. The only con is that you can only cut the material once, so you need to commit to your arrangement.? I had a lot left over for my arrangement though and should have some freedom to adjust things in the future.? One of the documents included with the packaging has a url to view videos for help in explaining how to do everything. Bottom line though is this is a game changer.? I would expect to see this now in other applications.? It's a great solution. Rated 5 out of 5 by TW Photo from Very nice So I was beginning to regret my Pelican case purchase due to the total frustration of the pick and pluck foam. Couldn't get the equipment I wanted to fit well and every time I pulled something out more foam came with it. What a mess. On the plus side, the more foam that came out the more equipment I could put in, it just wasn't protected! I researched the other types of protection for my Pelican and came across TrekPak. I was skeptical but took the leap and I am glad I did! I love it. I was able to add 2 lens and a few other things within my Pelican! Everything fits great, snug and secure! Once you figure out your layout it is pretty simple to install. Thank god they came up with this product! Rated 5 out of 5 by Michael from Worth it I love these dividers. My Pelican 1510 will hold two GH4 cameras, 4 small to medium sized lenses, a big 70-200mm lens, an audio recorder, microphones, spare batteries, memory cards, lens cleaning kit, chargers, and a screwdriver. Everything is organized very nicely and seems safe and secure. This kit isn't cheap, so I was a little afraid that I would be disappointed, but I am very happy with the purchase. I was tempted to dock this review one star because I don't think it needs to be so expensive, but it is such a clever/novel/well designed product that I don't regret buying it. Rated 5 out of 5 by Dustin DIll from These are great!! I am a professional wedding videographer, these are amazing!! Way better than the foam. I wouldn't suggest putting them under the plan with these unless you put extra foam to keep things from shaking around. But I would recommend them for carry on travel or travel to and from events. Amazing!! Side note always cut a little bigger and take one strip out at a time until it slides in snug. Rated 4 out of 5 by Anonymous from Best dividers for lenses Easy to put together. I feel confident my lenses are protected. I unfortunately did need to order one more divider from the manufacturer though. If you are OCD it is a blast! I recommend this product to everyone. Rated 5 out of 5 by David from Great insert Allowed me to fit equipment better than using the original padded insert that came with the 1510. Right now able to fit 1Dx, 5D Mk 3, 70-200 2.8, 24-70 2.8, 3 600RT flashes, ST-E3 RT, batteries, cards, 2 CP-E4N battery packs and extras. Just remember once layout is set it is fixed. if you want flexibility in your layout you will need to either order additional sets of the Trekpak or use the original insert with the Velcro tabs. Rated 5 out of 5 by Michael N. from Grande, No Foam After less than six months of intermittent student use, out of four cases with pick-and-pluck foam, one foam was totally torn apart, two were beginning to come apart, and one set of foam entirely vanished for some reason (students, right?) When cutting foam to accommodate a C-100 and all of its accessories, all of the odd shapes just aren't structurally durable. Also, with foam, small items like SD card cases tend to get lost down in between the foam layers as the case gets moved around. Needless to say, instead of ordering more foam, I bought the TrekPak divider system. Even though TrekPak is roughly triple the cost of foam, the durability and longevity added to the case is WELL worth the premium. They give you plenty of divider material, so even if you decide later on that you want to rearrange a few things, you should have enough. Cutting the foam is a lot of fun, too. Are the full-length dividers available? This kit includes 2 full-length pieces, among 2 or 3 shorter pieces (mine also came with another even shorter piece but I think that was unintended). What are the 'actual' outside dimensions and not the 'box' dimensions as provided in the specs? TrekPak states that the dimensions for the Pelican insert is approximately L 20 W 11 H 5 . Is this the most recent, 2017, version of the dividers that you cut yourself with an included cutting tool? Not sure if it's the 2017 version - bought mine in December 2016, but yes, you do cut it yourself. Includes cutting tool and plenty of anchor clips. I configured about seven separate compartments and still had plenty of divider left over. Fantastic solution - way better than the standard padded Velcro dividers. Compared to the standard 1510 padded dividers, is the bottom foam much thicker? The bottom foam in the 1535 with trekpak was too much that I couldn't fit as much in as I did in the 1510 with padded dividers. the bottom and the top foam are different when compared to the stock pick-n-pluck foam top and bottom. The top is a tighter fit which is great because it cannot fall out as easily when you open it. and the bottom is a thicker and I would say softer foam which I also like as it seems more protective to me than the pick-n-pluck. Does TrekPak Divider Kit for 1510 fit Pelican Air (1535)? If the depth of the EL22 is the same as my 1510 the trekpak kit will be ok. So glad I found this system far better than any Velcro packs. How much padding/protection do these offer, compared to the standard divider system? From the photos alone they don't look very thick, Thanks. Honestly not much compared to the pick and puck but it's good enough. I've had it with 3 L lenses in it and have never had any problems. If you space it correctly you shouldn't have any problems. &Acirc;&iquest;can i use this one in the nanuk case? I don't think so. These dividers were made specifically for Pelican 1510 and Pelican Storm iM2500.